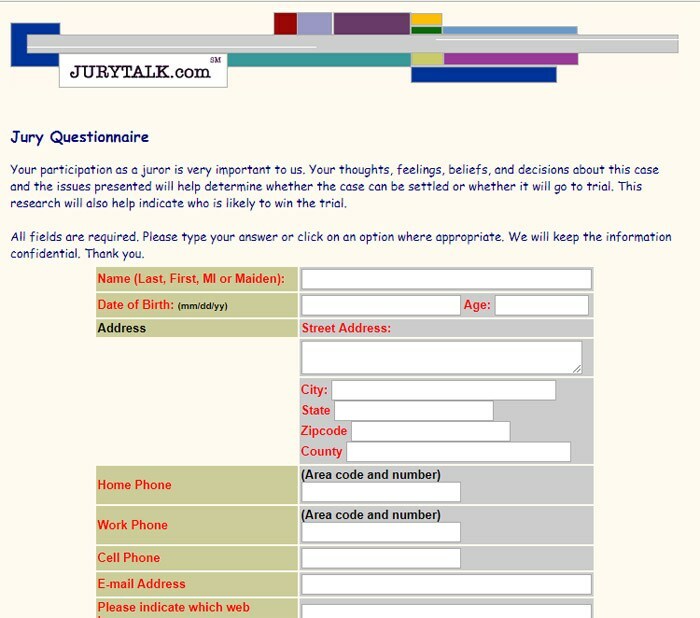 Can You Really Make Money With Jury Talk? I found this site while looking for ways to make a bit of extra money online. I’m all about finding a quality side hustle, and have been kind of into these ‘mock trial’ websites lately because a lot of them pay mock jurors for their time. But can you really make money with Jury Talk? 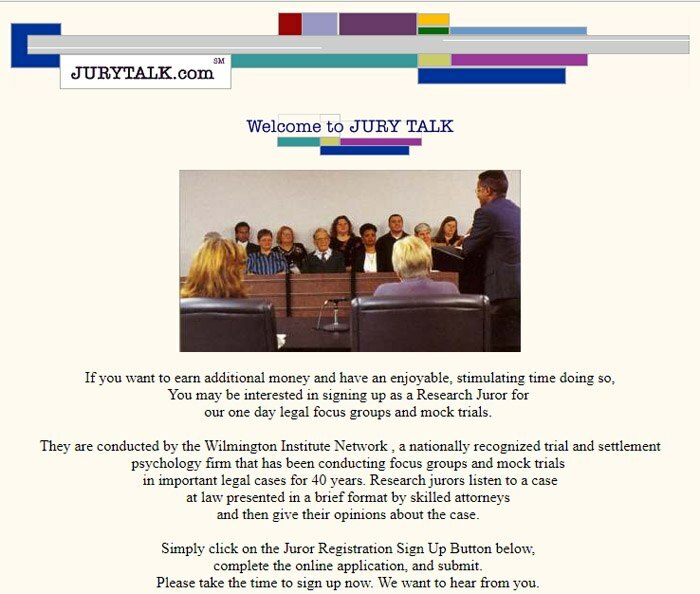 Jurytalk.com is only one of the several online mock-trial sites that we have found that offer to pay you for your participation. Mock trial sites are actually pretty interesting, and at first I had a difficult time figuring out what they were for. But as it turns out, these types of sites basically exist to help lawyers prepare their cases. They act almost like a ‘market research’ tool to see how a prepared case will look to potential ‘sample jurors’ in that demographic. This is important, because it helps lawyers to prepare their cases to better suit the demographic that they will be presenting it for. In fact, here is a quote from the landing page of the website, which helps to describe exactly what Jurytalk.com was intended to do. But how does this website compare to other similar websites like it? How does Jury Talk stack up when you look at the similarities it shares with other mock jury websites? First of all, Jury Talk did not give me a super awesome first impression. The landing page information was laid out weirdly, and I didn’t really like the graphic or lettering work at all. It looked old-fashioned (like a website from the early 2000s), and did not look very professionally designed, in my opinion. Plus, everything was situated to the left side—like it had literally not been reformatted in years (since before computer screens evolved to become flat-screened and wide-angled). I am not sure why any company would keep a landing page looking like this. I was using Google Chrome as a browser, so I am also not completely sure if this just had to do with my computer/browser/setup for whatever reason, but I had a feeling that it probably looked this way for everyone. So that was not really a good start. My next critique of this specific landing page was that there was seemingly only one link to click on. There was a ‘sign up’ button located at the bottom of the screen, and that looked to be the only direction left to go. That was it. No FAQ, no ‘About Us,’ nothing like that. So I went ahead and clicked on the Sign Up button, just to see what I could find. Here is where it led me. As you can see here, there were a lot of different slots to fill out while signing up for this site. But what you see in the screen shot is only a very small part of it. Scrolling down, you also have to fill out a lot of other spaces with information about everything from your citizenship status, to your relationships status, to gender, to your work information, to your ethnicity, to a section asking if you have ever been a party in a lawsuit or convicted of a felony. I do understand that they need to ask all of these questions. I was just really surprised that they didn’t say more about the service before asking potential mock jurors to fill all of this out. There was literally no information about how much you could make or anything. You just click ‘sign up,’ and bam… you need to fill all of this out without even knowing what you are getting yourself into. I almost feel like there must be some portal on the main company website that discusses all of this before sending you here, because I find it hard to believe that they would just leave things like this. In fact, I was kind of hesitant to even fill all of this out. It would take a substantial amount of time, and they are asking for quite a lot of information from me. How do I know if I even want to share my information with them at this point? How do I know whether or not it will really be worth my time? So the next thing I decided to do was to do some research about the company, to see if I could figure out some information about them before I gave them all of this info about myself. Doing some research led me to some interesting information about this site. First of all, I learned that the site seemed to have a pretty good reputation online. One site that I checked out listed them as the number-one mock jury website, though they never did mention how much you can expect to get paid. Next, I checked out another article that was specifically intended to let you know how much different mock jury sites pay (yes, this is a thing. Mock jury sites are apparently pretty popular right now online). But what was really interesting was that this article, which also shared payment information about all kinds of other sites, didn’t tell you what you could earn on Jury Talk. This led me to believe that a lot of these ‘review’ sites were not really using Jury Talk, but scanning the site to see exactly what they could figure out with a minimal amount of time investment. As a content reader, this made me feel a little bit cheated. But as someone trying to review websites like this, I actually understand… and kind of think that Jury Talk brings this on itself. If they don’t tell you what the payout is, then what incentive do you have to give it a try? Do they pay $1? Do they pay $5? Do they pay $10, or $50? So I decided that I wasn’t going to go through this entire sign up process, and I will tell you why. I am not necessarily a person who is obsessed with privacy. I don’t feel ‘afraid’ to share my name and birth date. But I will say that I need a good reason to share my information with someone. As long as I have a good reason for it, I am usually pretty trusting and chill about it. And they were asking me to do it without even bothering to give their webpage the kind of make-over that would make it look like a professional, legitimate site! At this point, I had still not found any reviews written by people who had actually used the site. Granted, these can sometimes be a bit tougher to track down, because they are usually located on forums or in comment sections—but after spending some time looking into it, I just came to a place where I had to admit that I was just not interested. I have certainly looked at Mock Jury sites that I would feel better about than this one. And granted, you can use more than one to try to make as much money as possible… but I just wasn’t really feeling Jurytalk.com. I have certainly looked at worse sites than this. In fact, I am not even saying that this was a bad site. But I will say that I was disappointed in it, for several reasons. First of all, the design was really old fashioned and left a lot to be desired. In all honesty, I almost didn’t feel assured that this was even a real site, mostly because of the design. Secondly, I didn’t like how zero extra information about the site was provided. If they had supplied a FAQ page, an About page, or some kind of ‘info’ page, that could have done a lot to help me put my concerns aside. But they didn’t do anything like this. And third, I had no idea how much they paid. And when you combine all of this with a long form that wants you to fill out quite a bit of personal information, it just goes a bit too far for me. I can see how sites like this can certainly be helpful, but this site just didn’t stand out to me. It was to the point where I felt uneasy about giving them all of my personal info—and trust me, I don’t usually feel that way. So yeah… I don’t think I will be using this one until it gets some kind of a makeover. Should you sign up and use it to make some money? Same here. My first impression was that it was a scam site. So poorly done and I will never give out my info to any site that doesn’t speak professionalism. Like you, I also need to know what they are about and what they pay. I got the same impression of Jury Talk. Not very impressive, but I did sign up a few months ago, I haven’t heard a peep out of them. What are some of the other mock jury sites you researched? Did you sign up for any of them?